In late September, hopes of a fourth Alabama title under Nick Saban seemed highly unlikely. The Tide had just lost to Ole Miss for the second straight year, and while the Rebels jumped in polls, Alabama was searching for solutions to their quarterback and pass defense problems. How did Alabama respond? Only by absolutely crushing everyone who stood in their path along the way on their way to an SEC title and berth in the College Football Playoff. They then continued their magnificent play, punishing the Big Ten champion Michigan State in the semifinal and then overcoming the previously undefeated Clemson Tigers in the National Championship. In 2016-2017, Alabama will enter the season as the hunted, which has become a common theme for them. Also common for them has been the abundance of impact players that left in the off-season. Even so, thinking Alabama won't be a serious national title threat is downright foolish. Few players in college football transformed as much as Jake Coker did from the start of the season to the end. The former Florida State transfer took over the quarterback job (a year later than many expected) and was far from overwhelming. While he performed well in the opener against Wisconsin, his comfort in the offense was an immediate question and he soon slumped. Saban turned to youthful Cooper Bateman for the Ole Miss game before he was leveled and left the game. From that point on, Coker showed the poise and confidence many had hoped they would get from the veteran. By the end of the season he was making NFL-level throws and playing with a chip on his shoulder. Unfortunately for Alabama, they won't get to see how much he may improve with a second year on the job, as he graduated. That leaves Saban and offensive coordinator Lane Kiffin with their third consecutive offseason of searching for their starting quarterback. Talent is not a problem at the position, as a number of the competitors are former big-time recruits. Bateman will compete with highly touted Blake Barnett, David Cornwell and the ultimate wild card, Jalen Hurts, for the gig. Bateman and Barnett have to be considered the favorites in the race, and Kiffin has done a terrific job with his quarterbacks over the past two years. Unfortunately, whoever starts at quarterback this year for the Tide will not have the comforting feeling of a Heisman-winning (at least not yet) running back behind them. Derrick Henry ran through everybody this year on his way to the sport's most prestigious trophy and while he was too often injured, backup Kenyan Drake also graduated. However, Alabama finds dominant running backs like few others and the next in line appears to be Bo Scarbrough, who has the looks of a beast in the backfield. 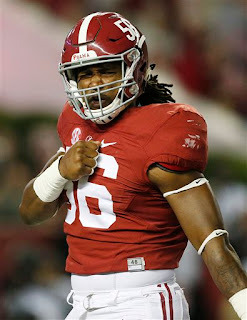 The sophomore is 6'2", 235 pounds and is built like a bulldozer; he showed plenty of potential last season and ran for 104 yards in 'Bama's spring game earlier this week. Joining Scarbrough will be last year's third-stringer, Damien Harris, another prolific high school player who showed signs a year ago. Alabama will also have big shoes to fill on the defensive side of the ball, where they lose defensive linemen A'Shawn Robinson and Jarran Reed and gritty linebacker Reggie Ragland. Let's just say that the young guys come in and star at quarterback, running back and on the D-Line from the get-go. It won't happen, and there are going to be growing pains, no matter how talented the new pieces are. However, the talent on the rest of the Tide's roster is truly mind-boggling, with future NFL players dotting every position group. It starts with sophomore Calvin Ridley at receiver, who broke numerous records in his first season in Tuscaloosca. The dynamic receiver doesn't quite have the size of Amari Cooper, but he is quicker and more agile and he could be in store for a truly monster season. Tight end O.J. Howard is back for his senior year as well, and should be a great complement to Ridley's deep threat abilities. After a disappointing junior season where he never truly found a rhythm, Howard came out in full force in the season's biggest game. reeling in a number of huge grabs to help seal the deal against Clemson in the National Championship. Howard has deceptive speed and should continue to grow as a pass-catcher in his final year on campus. Also joining the stacked receiver corps will be highly coveted transfer Gehrig Dieter. Dieter, who arrives from Bowling Green as a graduate transfer, has game-changing speed and put up huge numbers in the Falcons prolific offense. Those three will play a huge role throughout this season and will be looked at to guide whoever starts at quarterback. On defense, the Tide do have talent returning, mainly defensive linemen Jonathan Allen. Allen could have been a first or second-round draft pick but opted to return and hunt for another title. The powerful Allen will be supported by Tim Williams, a pass-rushing specimen who could be in store for a monster season. Williams managed to make his presence felt last season despite not seeing a ton of snaps. With another offseason to grow even stronger and quicker the senior should put up big numbers. In the secondary, expect big things from another stud that spurned the NFL, Eddie Jackson. Jackson can play an important role at either cornerback or safety. He is a great coverage guy but also showed excellent safety traits, and the ability to make plays. Minkah Fitzpatrick showed the potential to be a superstar as well in the stocked 'Bama defensive backfield. Perhaps more than ever, college football heavyweights scheduled major opponents and Alabama joined the trend. Alabama has actually done a good job of scheduling challenges early on and this year they will be tested by USC to begin the year. The Trojans are coming off a disappointing year that culminated in Steve Sarkisian's firing, but they are still going to give the Tide quite the challenge. Another non-conference test with sneaky Western Kentucky could be relatively close, and the Tide face a schedule from late October to late November that includes Tennessee, Texas A&M, LSU, Mississippi State and Auburn (with a bye in the middle). That should only put more pressure on a young team that while clearly talented, will have a number of issues to pan out before. There is few things more difficult in sports than winning two straight National Championships, especially in a college football landscape that now includes a Playoff. The Tide will not only have to find a quarterback, they'll have to plug him into an offense that isn't easy to learn and relies heavily on the mind of their signal-caller. A dominant, four-down back will have to show up as well, and he defense will still have gaps to fill, which will become increasingly difficult, considering that Alabama will be without their defensive coordinator Kirby Smart, who took the Georgia job. Playmakers like Ridley, Howard and Jackson will obviously keep Alabama humming for the most part, and it is hard to imagine 'Bama taking much of a step back, no matter what happens. "The Process" in Alabama has begun again and while the road will be extremely difficult, the Tide have enough throughout their ranks to close in on yet another title.